Flexible guidelines and a competitive rate. NewRez is committed to helping our U.S. military service members achieve their dream of homeownership. A full review of the borrower's credit profile will be completed. Borrowers with limited depth of credit or with layered risk characteristics must be reviewed for strong compensating factors. Refer/Eligible decisions will be considered for manual underwriting with a FICO ≥ 640 with a DTI less than 45% score provided sufficient compensating factors exist and all VA guidelines are met. 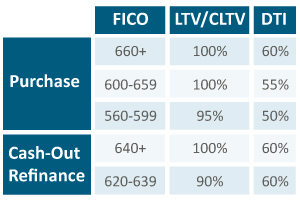 ^FICO 660 or Greater: LTV will be based off of the original loan balance. FICO less than 660: LTV will be based on a Full 1004. • Loans with greater than 6 months seasoning (6 payments made on the loan) and recoupment within 36 months are treated as Safe Harbor. • Loans with 6 months seasoning (6 payments made on the loan) and recoupment >36 months but less than 60 months are premitted with a reduction in rate to the borrower of 50 bp and the transaction meeting all other requirements of the Net Tangible Benefit test and must be coded in the system as Rebuttable Presumption. Follow VA for SMS-SMS IRRRL. See the VA IRRRL Guidelines in the full Product Profile for additional information.